Exciting times on the relist front! After a couple of light weeks, we had a flurry of action Monday. 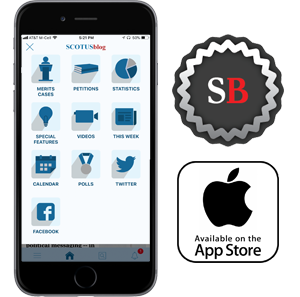 From last installment’s two new relists, the Supreme Court called for the views of the solicitor general in one case involving what accommodations employers must make for their employees’ religious exercise. 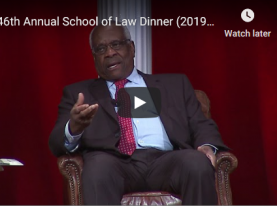 The court denied cert in the other case, which involved claims of racial bias in jury deliberations, prompting Justice Sonia Sotomayor to issue an opinion respecting the denial. The movement was even more impressive among the serial relists. The court denied cert in all four of the cases that raised the question whether a federal prisoner may file a petition for habeas corpus under 28 U.S.C. § 2241 to raise arguments that were foreclosed by binding (but erroneous) circuit precedent at the time of his direct appeal and original application for post-conviction relief under 28 U.S.C. § 2255, but that become meritorious in light of a subsequent decision. One was filed by the solicitor general, and it’s somewhat unexpected for the court to reject a government petition on an obviously recurring issue. But the government and another petitioner each claimed that their case was the only good vehicle, and apparently they succeeded in persuading the court that all the vehicles were bad. Mathena v. Malvo, 18-217 (relisted seven times), a case involving the younger of the two D.C. snipers who terrorized Washingtonians in 2002. The case presents the question whether the constitutional prohibition on life sentences for juveniles, which the Supreme Court recognized in 2012, applies retroactively to cases on collateral review even when imposition of the life sentence was not mandatory. Ramos v. Louisiana, 18-5924 (relisted six times), revisits whether the 14th Amendment incorporates against the states the Sixth Amendment guarantee of a unanimous verdict. The court upheld the constitutionality of nonunanimous state criminal juries in 1972, but the justices were splintered and there was no majority opinion. Kahler v. Kansas, 18-6135 (relisted five times), involves the constitutionality of the state of Kansas’ version of the insanity defense, under which the only insanity defense available is that the defendant lacked the mental state required as an element of the offense charged “as a result of the mental disease or defect.” Unlike some jurisdictions, Kansas does not recognize the defense that the defendant did not understand that his actions were wrong. Kansas v. Garcia, 17-834 (rescheduled three times and relisted three times). The Immigration Reform and Control Act requires employees to verify that they are eligible to work in the United States by submitting a Form I-9, but strictly limits the use of information on or attached to a Form I-9. Respondent Ramiro Garcia and two other respondents were convicted of identity theft based on their use of Social Security numbers. Because the defendants included those numbers in completing their I-9s, the Kansas Supreme Court concluded that the prosecutions were pre-empted by the IRCA, even though the defendants also used the numbers to complete other government forms. The state of Kansas sought review of whether the IRCA expressly pre-empts the prosecution; the court added the question whether the act impliedly pre-empts it. That brings us to this week’s lone new relist, Rentmeester v. Nike, Inc., 18-728. In 1984, photographer Jacobus Rentmeester took this photograph for LIFE Magazine of Michael Jordan in his Olympic uniform, jumping near a basket on a grassy knoll with legs splayed in a pose inspired by ballet and holding a basketball above his head in his left hand, as if about to dunk. 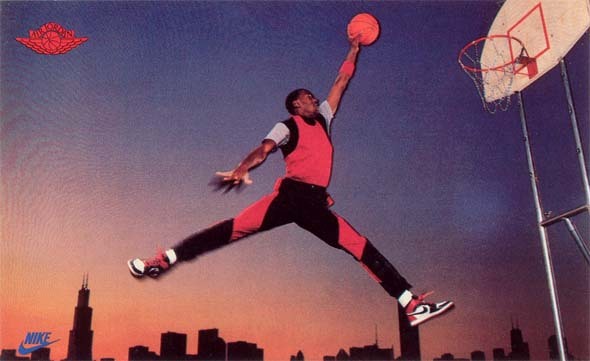 Nike later used in an advertising campaign a photo of Jordan jumping against the Chicago skyline, legs apart in a slightly different fashion, wearing red and black (Chicago Bulls, anyone? ), his right hand in a different position, and his left hand holding a basketball above his head and above the rim of a nearby basket. This composition then became the basis for Nike’s famous “Jumpman” logo. Rentmeester argues that Nike infringed his copyright by copying critical elements of his photograph: Jordan isolated with a basket, legs apart, caught at the apex of his jump, ball above his head in his left hand (Jordan was right-handed). Nike counters that ideas are not copyrightable – only the author’s expression of the idea is. Nike says that because its expression of the “jumping man” idea is so different (grassy knoll vs. Chicago skyline; off-center vs. centered; ballet-inspired jump vs. more conventional jump; U.S. Olympic uniform versus red and black clothing and Nike shoes; far from and below hoop vs. near and above it), the copyright was not infringed. The U.S. Court of Appeals for the 9th Circuit agreed with Nike. Supported by four amicus briefs, Rentmeester seeks to revisit that determination, arguing that it implicates a circuit split about the reach of copyright. On Monday we’ll have a better idea whether the court will just do it or whether they think Rentmeester’s claim is no slam dunk. I’ll show myself out. Thanks to Ben Moss for compiling the relists. Issue: Whether copyright protection for a photograph is limited solely to the photographer’s “selection and arrangement” of unprotected elements, as the U.S. Court of Appeals for the 9th Circuit held below, or whether it also covers elements of the photograph that express original, creative judgments by the photographer, as held by the U.S. Courts of Appeals for the 1st, 2d and 11th Circuits.